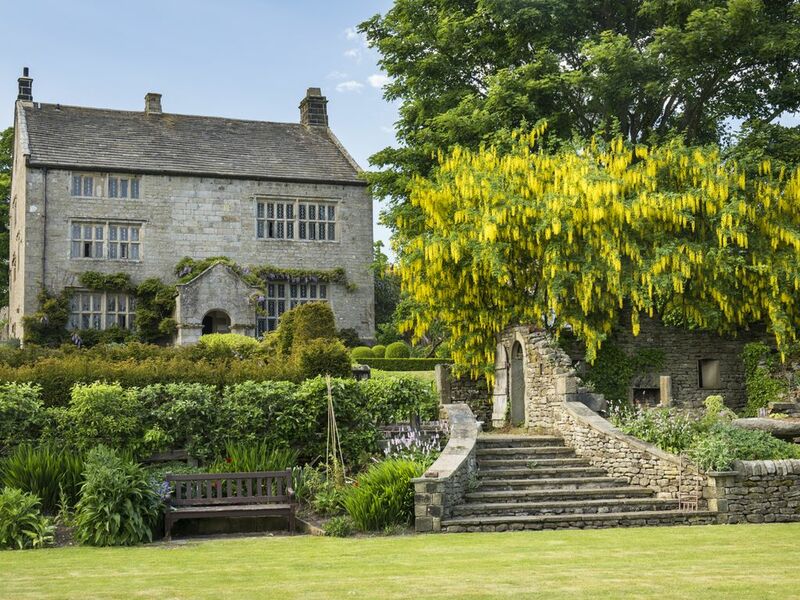 HIgh Hall is a magnificent 16th century property located in the delightful village of Appletreewick in North Yorkshire. It boasts seven bedrooms and four bathrooms, sleeping 14 guests. Inside also comprises a grand hall with a woodburning stove, a sitting room, kitchen/diner, along with a separate dining room with another woodburning stove. There is a cloakroom and a lower ground floor utility as well as a Minstrel's Gallery and a third floor games room. Outside is an enclosed, lawned courtyard garden with patios, pond and furniture along with a summerhouse with a music system and off-road parking for 7 cars. High Hall is a unique experience in a splendid area of Yorkshire. Amenities: Oil central heating with two wood-burning stoves. Infra-red panel radiant heating to the top floors. Electric AGA, double oven, electric hob, microwave, drawer fridge, drawer freezer, large fridge/freezer, washing machine, tumble dryer, 2 x dishwashers. Smart TV's with Freeview, DVD, Bluetooth speakers, radio, WiFi, selection of books, games, toys. All fuel and power incl in rent. Supply of logs on honesty box basis. Bed linen and towels inc. in rent. Cot and highchair available. Off road parking for 7 cars. Lockable bike storage and maintenance facilities. Enclosed, lawned garden with patios, folly, koi pond and furniture. Summerhouse with music system and studio space available for yoga and pilates. Hot tub. No dogs sorry. No smoking. Two popular pubs within 5 minutes walk. Shops 5 miles. Note; Check in time 4PM. Please note: No hen or stag parties. Town: The Dales village of Appletreewick is set in Wharfedale, just 9 miles north of the market town of Skipton. It is set close to a river and is home to two award-winning pubs’. The many walks include the Dales Way following the banks of the River Wharfe, whilst the nearby Parceval Hall Gardens offer woodland walks and quiet gardens with views of Simon Seat. Over four split-level floors. Seven bedrooms: First Floor: Landing and Minstrels' Gallery. 1 x kingsize,1 x master bedroom with super king-size. Large bathroom. Upper first floor: 1 x kingsize with ensuite (shower, basin and WC). 2nd floor: Games room / sitting room with large flat screen TV, traditional games. Upper Second floor: 1 x king-size, 1 x super king-size (zip/link, can be configured as twin on request) with en-suite (shower, basin and WC). Top Floors: 1 x kingsize, with ensuite (shower, basin and wc), 1 x kingsize room with small dressing room/snug attached. Sleeps 14. Ground floor: Great Hall with wood-burning stove. Spacious sitting room. Kitchen/diner with electric AGA, Separate large dining room with wood-burning stove and refectory table seating 14. Screens Passage and glazed Entrance Porch to gardens. Cloakroom with basin and WC. Lower ground floor: utility area with washing machines and dryer. Oil central heating with two wood-burning stoves. Infra-red panel radiant heating to the top floors. Electric AGA, double oven, electric hob, microwave, drawer fridge, drawer freezer, large fridge/freezer, washing machine, tumble dryer, 2 x dishwashers. Smart TV's with Freeview, DVD, Bluetooth speakers, radio, WiFi, selection of books, games, toys. All fuel and power incl in rent. Supply of logs on honesty box basis. Bed linen and towels inc. in rent. Cot and highchair available. Off road parking for 7 cars. Lockable bike storage and maintenance facilities. Enclosed, lawned garden with patios, folly, koi pond and furniture. Summerhouse with music system and studio space available for yoga and pilates. Hot tub. No dogs sorry. No smoking. Two popular pubs within 5 minutes walk. Shops 5 miles. Note; Check in time 4PM. Please note: No hen or stag parties.